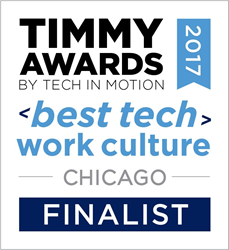 NuCurrent, a leading wireless power system and magnetics solution provider, announces Tech in Motion Chicago has named NuCurrent a finalist for the 2017 Timmy Best Technology Work Culture Award. Now in its third year, the Timmy Awards recognize the top workplaces for tech professionals. Winners for each of the four award categories will be announced at Chicago’s Timmy Awards on September 21 at 1871 in Chicago. The Timmys are presented in four categories: Best Tech Work Culture, Best Tech Manager, Best Tech Startup, and Best Tech Workplace for Diversity. The Best Technology Work Culture Award is presented to the company that promotes technical creativity, innovation and learning, and rewards contributions from its entire technology team. All award finalists are selected by a panel of accomplished judges representing Illinois technology. The public can contribute to the selection of this year’s winners by voting online from August 24–September 8. Winners will be determined by a composite score of the judges' scores and voting by the public. Past award winners include LearnVest, Venmo and Trip Advisor. NuCurrent was recently named a 2017 FLEXI Product Innovation Award winner, 2017 ITA CityLIGHTS Industry Disrupter Award Finalist, and 2016 IoT Breakthrough Awards’ M2M Embedded Hardware Company of the Year. The company was also named a Chicago Inno 2016 50 on Fire Winner, which honor the year’s most groundbreaking individuals and organizations across industries in the Chicago area, and a winner of the 2015 Chicago Innovation Up-and-Comer Awards. NuCurrent was also named No. 1 on the 2015 Crain’s Chicago Business Eureka Index with the highest per-capita patent output of any company in Illinois. The company was also listed in the top 10 percent overall in patent quality score, which considers the uniqueness of the invention covered by a patent and other important factors. To view the 2017 Timmy Awards list of finalists or cast your vote for the award category winners, visit http://www.meetup.com/TechinMotionChicago/events/241029182 between August 24–September 8. To learn more about NuCurrent, please contact info(at)nucurrent.com or visit http://nucurrent.com.